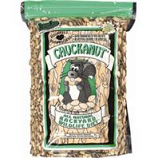 Chuckanut backyard wildlife diet is a gourmet food blended to satisfy all your backyard visitors.. This blend attracts squirrels chipmunks rabbits and blue and stellar's jays.. . . .